I don’t rewatch too many full lengths, but I’ll still drink a cup of tea and sit through this one. There’s so much American media in skateboarding, it was nice to see something British and done really well. I was aware of First Broadcast and other [Blueprint] videos before, because friends had all the VHS tapes, and Lost & Found came out around the time the internet started posting videos. I remember going to my friend’s house and waiting for two-and-a-half hours for the trailer to download. I can pretty much pick any part from Lost & Found — I watched it religiously. As a kid, he didn’t necessarily have my favorite part. I would say he’s a bit of an underdog in U.K. skateboarding. He’s an incredible skater who was pro for Blueprint, and he’s retired now. He doesn’t look like a typical skateboarder — he looks like a bloke you’d see down at the pub. He doesn’t dress how you expect a skateboarder to dress, and his style does not overdo anything. The song is good, and McGee edited it with so much thought put into the art direction. At the end of the part, he does a lipslide down this handrail, and there’s some sort of stage at the bottom and he goes straight into a manual on this stage — it’s insane. I wasn’t too aware of him when he was skating. He hurt his ankle and I think he wasn’t able to skate anymore. I had this video as a kid, and didn’t really pay attention to details at that point. In the last five or six years, I started watching it more, and it just gives you this specific feeling — I guess that is what skate videos are supposed to do. London seems completely empty in the video; now every bit of footage you see from London has tons of people and security guards everywhere. It was emptier then, but the part seems like he’s on his own, skating through a dream. I think it might’ve been his last part — I’m not positivie — but something about that with the Mazzy Star song and everything makes it quite emotional. This might be my number one favorite part. It is such an amazingly put together part: the “Sleepwalk” song, everything was calm, the clips felt like they played a bit too long sometimes. He did everything so proper that I remember being blown away. After that part, I started wearing tie-dye t-shirts, doing big-spin flips. I’ve been to California since this came out, and he skates pretty dry, obvious spots. 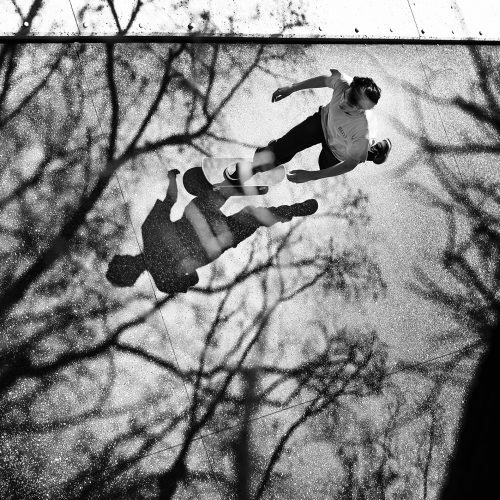 It shows that it doesn’t really matter what you’re skating if you’re doing the right stuff on it — anything can be the best part ever really. People didn’t know about him when that part came out, which is pretty impressive. That never happens anymore — when there’s someone that new and good. Social media lets the cat out of the bag. He does quite a long line in it, and it was probably the first time the thought “wow, that’s quite a long line” came into my head. He does a switch heel over a bench, a switch tre flip, a couple wallie-type tricks, and ends with a bigspin front blunt on a little bench. I remember thinking how good it looked that he ended the line on a really good trick. Having the hardest trick in the line be the last one really resonated with me. After that, I tried to do some long lines, which were probably terrible. I’ve watched all his parts after this, and have heard he’s a bit of a prick, but I want to keep this idea of him in my head as a stoner Californian just cruising, doing long lines and bigspin flips in pajamas. Like Trapasso, nobody really knew about him when this came out. He came out of nowhere and put together this incredible three-minute part. It makes so much more of an impact if you haven’t seen him before. We’re on Dickies together, and I’ve gotten a chance to hang out with him a bit, and I’d always ask him about filming that part. It seems like he was just on the hustle, working in New York, and filming in between. He’s the kind of skateboarder that people want anything out of. Every single trick he films, you can tell he put 100% of his effort into it. We filmed this video for about a year, and I had never skated with Luka before. We met up with him, skated a few times, and it’s what we were filming for anyway, so he kind of just hopped on board the video. He was the rawest, most personified skate rat. Skate all day, skate all night. He’s still coming out with parts and stuff, but the way Jake made this part was perfect in my eyes. He does these long lines, the song is good, and it’s a very rewatchable part. On the last line, he hops across the street, grabs onto a post, and does this powerslide thing where he does a complete turn from one angle to the other. It makes me want to go skate every time I watch it. It also reminds me of that specific time in my life, which is nice. A lot of the stuff I’ve done after this kind of came off the back of that video. Great list. the couple of unknown and out of comminsioned skaters featured must be super stoked to see their parts on here. props for giving respect to the working man. That first part is so good and so unknown to me and i’m sure others until now. Absolute belter of a list. Scott Palmer The Don.